All transactions are safe and secure with a reliable history in online purchasing behind each of our associates. 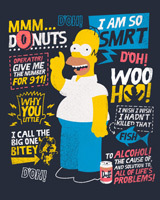 Buy the Homer Simpson Quotes t-shirt to own Simpsons clothing and merchandise. Dress in this unique piece of Simpsons merchandise that shows some of Homer Simpson's most popular quotes, including, "Woo Hoo!" The funny design will surely get you some laughs. Cheer on your friends in one of these Simpsons t-shirts. Homer Simpson is a proud member of the Springfield Unathletic Dept. and employee of Mr. Burns. Get this one of a kind Simpsons tee along with one of the Simpsons hats. You'll be ready to be lazy in no time. In addition to the Homer Simpson Quotes tee above, browse the Simpsons Clothing Gallery for more apparel like men's and women's clothes, kids shirts or hoodies.